Hi! I'm Melissa and I'm from The Happy Peach! I've developed a huge love of cloth and want the world to know about the wonderful fluffy benefits there are to using cloth nappies! I'm not quite sure what it is that puts people off using cloth, maybe it's the initial start up cost or maybe it's the thought that cloth is hard work, some people think they are less reliable and for others I think that they just don't know about it. Disposable companies have millions of pounds to spend on advertising that cloth companies don't have and this puts the disposable companies at a huge advantage. 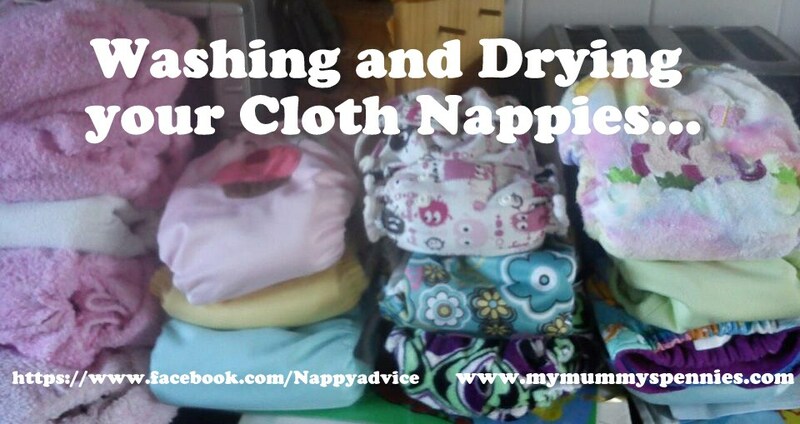 One other thing that puts people off is the nappy washing, I'm hoping this guide will help, it's really simple to do and it's not something you need to do daily, I only do around 3 a week. I shove the wash on at night and it's all done by the morning! The dreaded nappy wash! The thing that puts people off even considering cloth. Images of handling poo filled terrys and sloshing wet buckets spring to minds. How times have changed! As time has moved on so has the wonderful fluffy world and also the way we wash them. Modern cloth nappy's are more attractive than ever, not just in the way they look but also in the way they're cared for! Cloth nappy brands are making their products easier to use and they are easier to wash! With a good wash routine your nappies will last you for multiple children! otherwise a 40 with occasional 60 is just fine, if you do a 60 every wash it does reduce the lifespan of the nappies due to nappy components being sensitive to prolongued high heat, the velcro and waterproof layers are the main parts affected and wont last as long. If you are washing your nappies with your usual wash powder (powder rinses out better than gels/liquids) only use 1/3 - 1/2 the recommended dosage, this is to stop detergent build up in your nappy fibres, when detergent builds up nappies can hold onto smells and become less absorbant. At the end of your spin cycle if you can see bubbles you've used to much powder so run an extra rinse or two until all the bubbles have gone! Then just remember to use a bit less next time. I have a baby/toddler function on my wash machine that automatically runs an extra rinse at the end so I use that program. I've recently discovered a product called stinkpot and this is what I now use to wash my nappies in, I love it and have written a full review on my page! Also, NEVER use fabric softener this will put a film on your nappy fibres and make them less absorbant. So to summarise here are the simple steps! What you do next is up to you, once they're all clean you put them away how you choose, for me on the other hand this is my favourite bit!! I love grabbing all that warm fluff out the dryer and it all smelling fresh and ready to use! I stuff my pockets so they're ready to go and put them in wicker baskets and then stack my shaped fitted nappies on a shelf and ready to start over. I love my fluffy cloth stash and it's probably the most organised part of my house haha! Thank you for sharing your tips Melissa! Does anyone else have any tips for washing and drying your nappies? Or any questions? Please do show Melissa some comment love and remember all comments get entered into our prize draw! Melissa you are such a star spreading your fluffy love! definitely considering going luffy once my stock pile of nasty disposables is used up! Great post. I'm just potty training my youngest and he's wearing normal pants now. I actually miss washing and hanging my fluff out to dry. It's not that hard at all. great advice! i use an ecoegg for all my washing that way i dont have to worry about using too much or too little powder I dont have a tumbledryer but have no issues getting them dry on the clothes horse. i think some people think they cant use them as they have nowhere to dry them in winter but its just the same as washing and drying clothes! Another great post filled with lots of information and tips highlighting that washing cloth nappies is not that bad a chore....it is a 'chore' I love myself. Great post, some very useful advice that I hadn't seen before, so thank you. I used cloth on my first son just every now and then, but my second son is in them full time, has been for 3 weeks now, he's not quite 5 weeks old! And it's going well. A really useful, informative post, especially for someone like me with so much to learn about this whole new world of nappies! ER, many of them having gone on tto become big stars in Hollywood. that everything was fine, that the child would grow out of it. Well, the statue stands aat an astonishing thirty three feet.